This appendix describes use of the Faust programming languageK.1by Yann Orlarey [61,31] to generate real-time DSP plugins from a high-level specification. 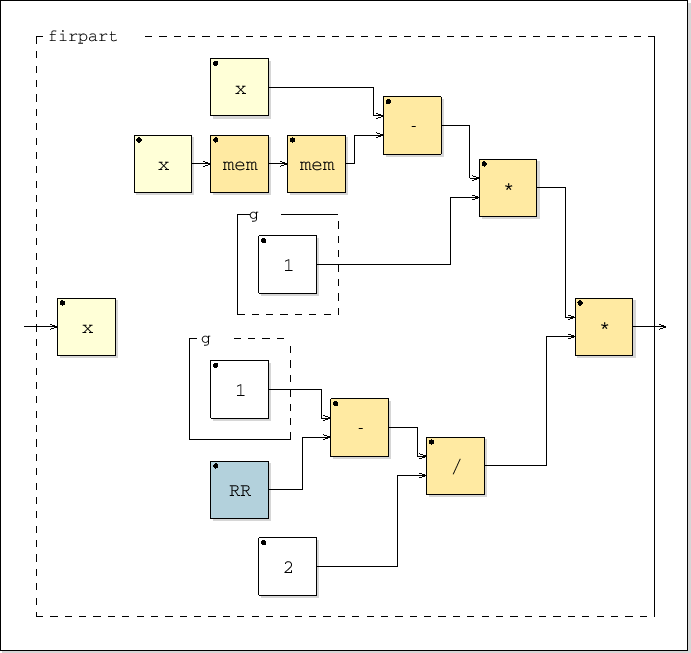 In addition to generating efficient inner loops, Faust supports Graphical User Interface (GUI) specification in the source code, and can emit code for various application and plugin environments.K.2 Moreover, Faust can generate easy-to-read block diagrams directly from the source, illustrating signal flow and processing graphically. 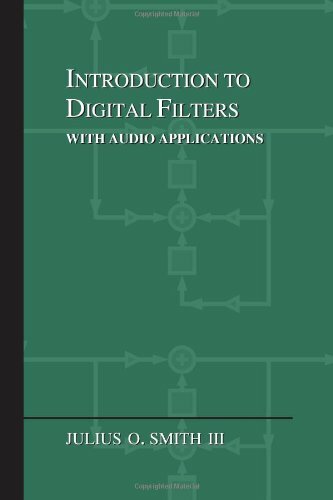 This appendix focuses on generating pd, LADSPA, and VST plugins from a simple Faust program specifying a resonator driven by white noise. 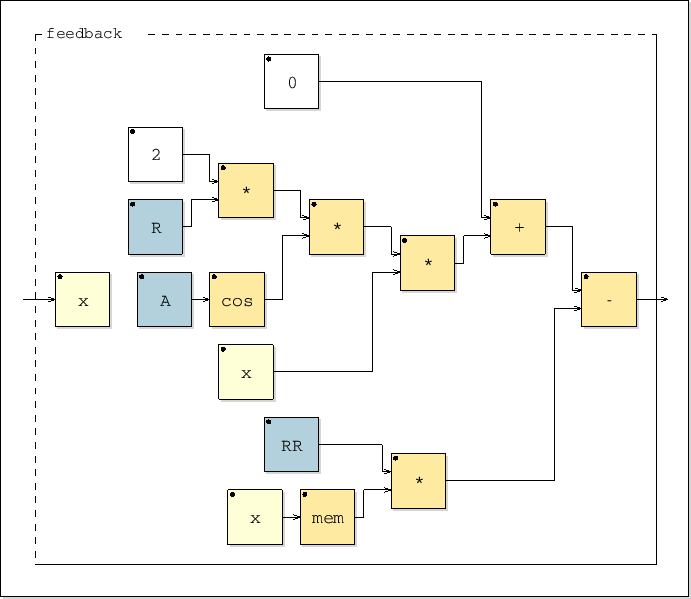 creates a subdirectory of the current working directory named cpgr.dsp-svg which contains a ``scalable vector graphics'' (.svg) file for each block-diagram expression in cpgr.dsp.K.6For this example, there is a block diagram generated for the process line, and for each of the last five lines in the with clause (not counting the comment). The dot on each block indicates its standard orientation (analogous to a ``pin 1'' indicator on an integrated circuit chip). 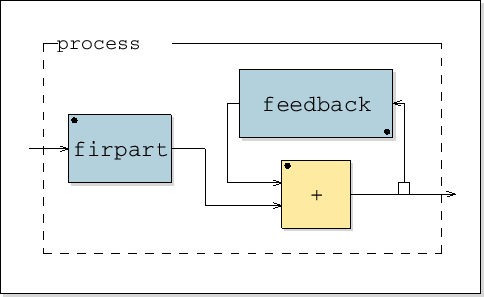 The small open square at the beginning of the feedback loop indicates a unit sample delay introduced by creating a signal loop. Needless to say, it is important to keep track of such added delays in a feedback loop. Figure K.2: Main process block for the constant-peak-gain resonator. Figure K.3: FIR-part ((x - x'') * g * ((1-RR)/2)) in Faust. If not for the added sample of delay in the feedback loop (indicated by the small open square in Fig.K.2), the feedback-path processing would have been instead 0 + 2*R*cos(A)*v' - RR*v''. Figure K.4: Feedback block (0 + 2*R*cos(A)*x - RR*x') in Faust. Note that the block diagrams are drawn as though all details of the expression are to be evaluated every sample. However, the Faust compiler instead computes constant expressions at init time and allocates memory locations for them. More generally, the Faust compiler separately optimizes full-rate signals at the sampling rate (calculated in the inner loop), slowly varying signals (updated at the ``buffer rate'' outside of the inner loop--currently every 64 samples), and constant signals (evaluated once at initialization time). causes the C++ signal-processing code to be printed on the standard output, as shown for this example in Fig.K.6. Notice how the constant subexpressions are computed only once per instance in the instanceInit member function. Also, even in instanceInit, which is only called once, repeated computation of is avoided by use of the temporary variable fConst1, and division by 2 is converted to multiplication by . faust cpgrir.dsp (and reformatted slightly). Even if one prefers writing real-time signal-processing programs in C++, C, or assembly language,K.8the ability to generate user interfaces and plugins with Faust is compellingly useful. The first line uses faust to generate a compilable .cpp file, this time using the architecture file puredata.cpp which encapsulates the pd plugin API. The second line (which wraps) compiles cpgrui-pd.cpp to produce the dynamically loadable (binary) object file cpgrui~.pd_linux, which is our signal-processing plugin for pd. Such pd plugins are also called externals (externally compiled loadable modules). The filename extension ``.pd_linux'' indicates that the plugin was compiled on a Linux system. Figure K.8 shows an example test patch,K.9 named cpgrui~-help.pd,K.10written (manually) for the generated plugin. By convention, the left inlet and outlet of a Faust-generated plugin correspond to control info and general-purpose messages. Any remaining inlets and outlets are signals. 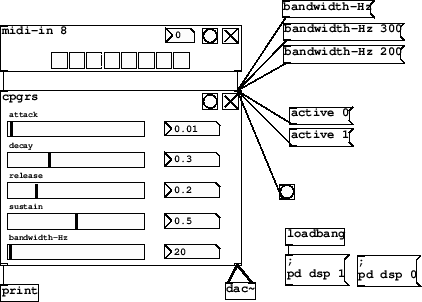 Figure: Pure Data test patch cpgrui~-help.pd exercising features of the external pd plugin cpgrui~ generated by Faust using the puredata.cpp architecture file. These are the three controls we expected corresponding to the frequency, bandwidth, and gain of the resonator. However, note that the message-names generated for the controls have changed. In particular, spaces have been replaced by hyphens, and parentheses have been removed, to observe pd naming rules for messages . /faust/peak-gain, is the complete ``fully qualified path'' that can be used to address controls within a hierarchy of nested controls and abstractions. For example, if we were to add the instance argument ``foo'' to the plugin (by changing the contents of the plugin box to ``cpgrui~ foo'' in Fig.K.8), then the path to the peak-gain control, for example, would become /foo/faust/peak-gain (see  and the Faust documentation for more details and examples). In the test-patch of Fig.K.8, the various controls are exercised using pd message boxes. For example, the message ``peak-gain'' with no argument causes the plugin to print the current value of the peak-gain parameter on its control outlet. Messages with arguments, such as ``peak-gain 0.01'', set the parameter to the argument value without generating an output message. 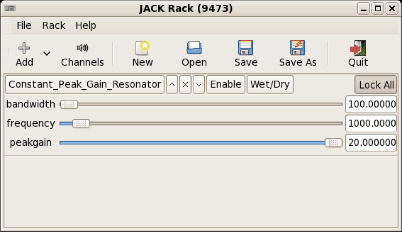 The slider and number-box output raw numbers, so they must be routed through a message-box in order to prepend the controller name (``peak-gain'' in this case). The plugin input signal (second inlet) comes from a noise~ object in Fig.K.8, and the output signal (second outlet) is routed to both channels of the D/A converter (for center panning). In addition to the requested controls, all plugins generated using the puredata.cpp architecture file respond to the boolean ``active'' message, which, when given a ``false'' argument such as 0, tells the plugin to bypass itself. This too is illustrated in Fig.K.8. Note that setting active to ``true'' at load time using a loadbangK.11 message is not necessary; the plugin defaults to the active state when loaded and initialized--no active message is needed. The loadbang in this patch also turns on pd audio computation for convenience. Figure K.10 shows pd patch developed (manually) to test the plugin wrapper generated by faust2pd. Compare this with Fig.K.8. Notice how the three controls are brought out to the plugin-wrapper object automatically using the ``graph on parent'' convention for pd abstractions with controllers. The bang button on the plugin resets all controls to their default values, and the toggle switch in the upper-right corner functions as a ``bypass'' switch (by sending the active message with appropriate argument). The previous mechanism of setting controls via message boxes to the control inlet still works, as illustrated. 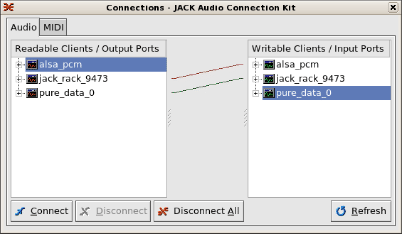 However, as shown in Fig.K.9 (or by opening the plugin-wrapper in pd), the control outlet simply receives a copy of everything sent to the control inlet. In particular, ``bang'' no longer prints a list of all controls and their settings, and controls cannot be queried. 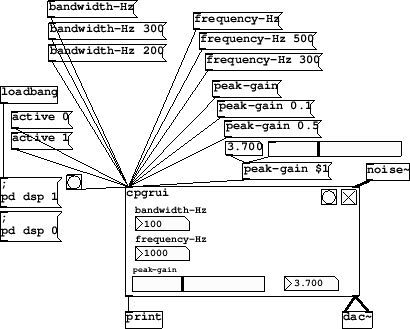 Figure: Pure Data test patch (cpgrui-help.pd) for exercising the plugin-wrapper (cpgrui.pd) generated by faust2pd to control the faust-generated pd plugin (cpgrui~.pd_linux). 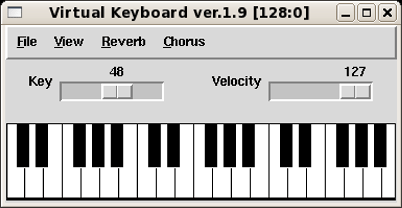 This section describes generation of a Windows VST plugin starting from Faust code, again using the constant-peak-gain resonator example. Next, the file cpgrui_vst.cpp was copied over to a Windows-XP machine with Microsoft Visual Studio Express installed (including Visual C++ 2008). The programming sample ``again'' from the Steinberg VST-2.4 SDK was copied to an adjacent directory cpgr and trivially modified to create a compilable C++ project. (Specifically, replace again.cpp by cpgrui_vst.cpp, rename again.vcproj to cpgr.vcproj, and change all occurrences of ``again'' to ``cpgrui_vst'' in cpgr.vcproj, and change ``Gain'' to ``CPGR'' to rename the plugin. Finally, double-click on cpgr.vcproj to launch Visual C++ on the cpgr project.) Selecting the menu item ``Build / Build cpgr'' creates cpgr/win/Debug/cpgr.dll (the VST plugin itself). To test the plugin, it was copied into the ``Unsupported Plugins'' folder on the Receptor, and installed by clicking the ``1 installs'' button on the Receptor's Setup page. 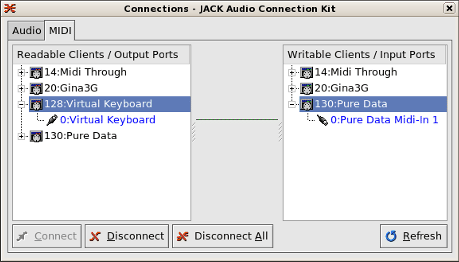 After that, the plugin could be instantiated on a Receptor ``Mix'' channel, as shown in Fig.K.13, and Fig.K.14 shows the automatically generated edit window of the plugin. 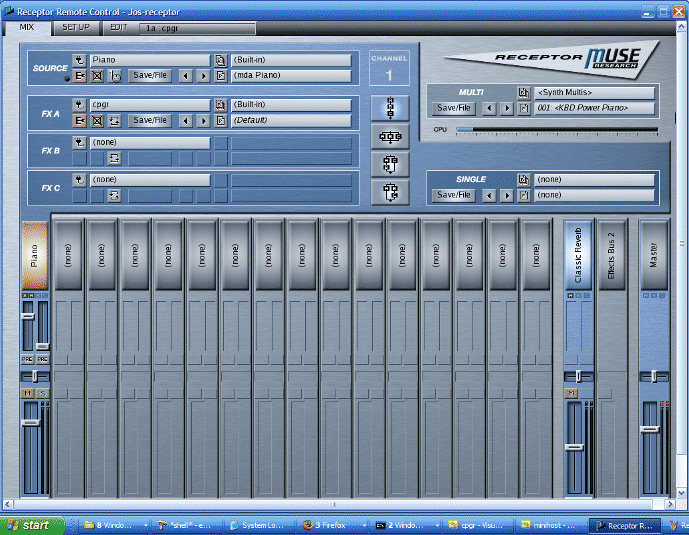 Figure K.13: Screenshot of the Receptor Remote Control program, showing the ``Mix'' view. 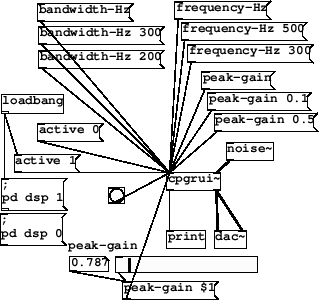 The constant-peak-gain resonator (named cpgr) is instantiated as a plugin processing the ``Piano'' source signal. 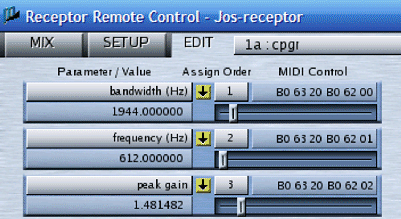 Figure K.14: Screenshot of the upper-left corner of the parameter-editing window of the Receptor's remote-control program showing the constant-peak-gain resonator parameters. Beginning with Faust version 0.9.9.4j-par, a new makefile called Makefile.w32vstcompile is distributed in the examples directory. This makefile can be adapted to work on Fedora F8 Linux as follows. In Makefile.w32vstcompile, edit the VST line to say where your vstsdk2.4 directory is located, and change all occurrences of i586-mingw32msvc to i386-mingw32. (Remember to say umount /mnt/receptor when you are done.) The Receptor's IP Address (typically assigned by DHCP) can also be viewed by pressing the Setup button and rotating the Top Display Knob to that field.